From The Agony of Oppession The elders kick everyone else around. It seems like a vampire has no purpose in this world except as a punching bag for the old ones. They'll knock you down, push you around and force you to do their vile bidding. That is, when they're not drinking you dry. To The Ecstasy of Freedom But you are not alone. We are the anarchs, and we are the future. Read this book, and learn why the elders despise us. Read it, and learn of the lies they tell. Read it, and learn why we are so feared. 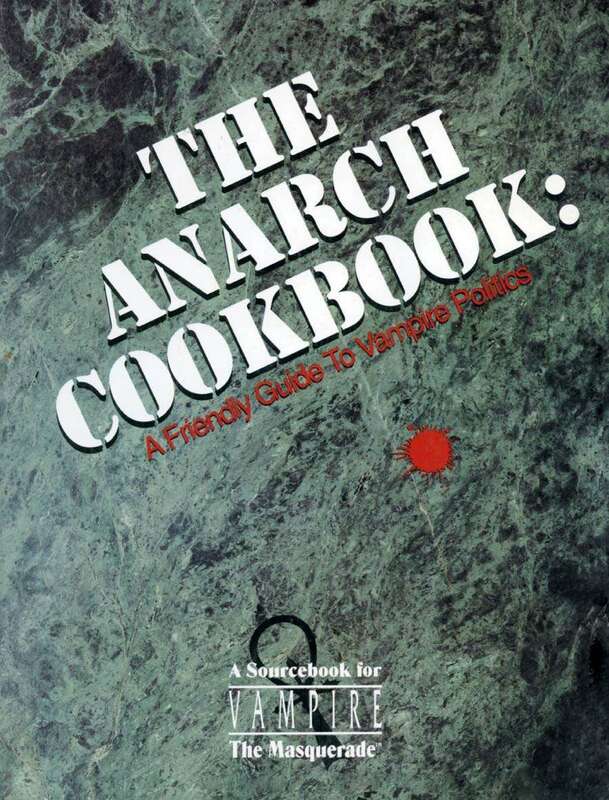 The Anarch Cookbook includes: the weapons, strategies and tactics of the anarchs, useable by players and Storytellers; the hostory of the Anarch Movement, from its beginnings millennia ago to the Anarch Free States today; biographies of prominent anarchs, as well as their immortal arch-enemy. Excellent scan, no material seemed to be missing. This is not a long book, and is light on rules, but has plenty of evocative fluff to set the mood for an Anarch Chronicle. There are discussions on the history of the movement, and several characters that would evolve to become key to the long-term metaplot of V:tM were introduced. Keep in mind this was one of the first couple of splat books that were made for 1st ed V:tM, so a lot of the material will be extremely dated, but it is still an entertaining read.